We are the best rated hotel in Ludwigsburg, with excellent ratings on every online booking portal. Our hotel and boardinghouse is providing you with spacious rooms and a favorable location in the city center of Ludwigsburg. Our service features, as well as our heartily team, promise a relaxed stay. Spend the night in the appealing ambiance of our historic building with modern room setup. 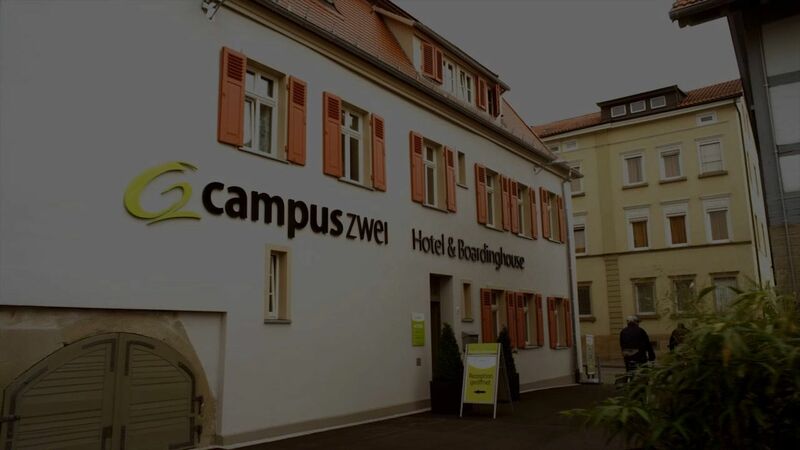 The Hotel & Boardinghouse campuszwei™ is located in the center of the city. It is the perfect starting point to easily reach the wonderful places that Ludwigsburg has to offer. Explore the different facets of this baroque city. It is historic and modern, quiet and lively, naturally preserved and urban. No matter if you want to visit the Residential Palace, the Favoritepark (naturpark of the castle Favorite) or the Ludwigsburg castle festival, all these sights are in walking distance. With our exclusive services, we ensure you a relaxing stay in our hotel. For your convenience, a warm service team will be at your disposal to assist you with advice and assistance. "Best rated hotels in Ludwigsburg"
"Preferred partner" based on fabulous guest ratings. In Ludwigsburg the hotel with the best ratings. A very nice hotel, located in the city center, with very friendly staff. Young, fresh and friendly. Very nice and considered staff. The rooms are very clean and also very spacious. The hotel rooms are high-class, silent and spacious. Appealing design of the hotel.